Annual Report: Does Your Business Need To File One? Once you’ve formed an LLC or a corporation for your business, your operational and administrative obligations are going to be higher than a sole proprietor’s. While an LLC involves significantly less paperwork and formal administration than a corporation, both business entities generally need to file an annual report with the state. Here’s what you need to know about this important filing to keep your small business in corporate compliance. Also known as a Statement of Information, the annual report is typically required by the state so they can keep up to date with your company’s vital information. For example, you may be asked to submit information about directors and officers, and the registered agent and office address of the company. In most states, there’s also a small filing fee associated with the report. All states except Ohio and Alabama require some kind of annual report. Specific due dates vary from state to state. In some cases, the deadline falls on the anniversary of your business’ incorporation/formation date. In other cases, it’s when your annual tax statements are due and in some cases, it’s at the end of the calendar year. Be sure to know your specific filing deadline by checking with your state’s secretary of state office. What Kind of Information Do I Need to Include in the Annual Report? The annual report will generally ask you for basic contact and operational information. The type of details you provided when you first filed to form your corporation or LLC. The specific details will vary by state and business type. Business officers: President, secretary and treasurer. What is an Initial Report? In some states, LLCs and Corporations are also required to file an initial report shortly after the LLC/Corporation is formed. Like the annual report, the initial report contains basic information about business activity (registered address, directors, etc.). What Happens if I Don’t Turn in My Annual Report/Initial Report? These reports may seem like a trivial paperwork, but they’re actually quite important. Missing the deadline can result in late penalties and fees (and there’s no reason your business should pay a dime more than it ought to). In the worst case scenario (i.e. if you’ve skipped your annual report for multiple years on end), your company can be suspended or dissolved. In addition, you need to think about keeping an LLC/corporation in good standing in order to maintain its “corporate shield.” One of the biggest advantages of these formal business structures is that they minimize your personal liability (shields you from the activities of the business). But if your business happens to be sued and the plaintiff can show that you haven’t maintained your LLC/corporation to the letter of the law (i.e. your annual reports aren’t up to date), your corporate shield might be pierced and you can be personally liable. As a small business owner, I know just how hectic your schedule can be. But be sure to set aside some time to address your business’ administrative obligations. Know your deadlines and get your paperwork in on time. It’s a relatively easy task and will make sure your business stays in compliance (and you won’t have to pay any hefty fines). The post Annual Report: Does Your Business Need To File One? appeared first on Small Business Trends. Employee debit cards offer a convenient alternative to paper checks. A payroll card allows businesses to avoid higher payroll fees. It also gives employees who may not have a bank account an easy way to access their money. An estimate suggests $68.9 billion will be loaded onto payroll cards by 2017, reports MSN News. So you will be in good company, if you decide on this option. But beware of state and federal wage rules when putting a debit card payment system into place. The American Payroll Association and the National Consumer Law Center share some cautions. Keeping these rules in mind can help you avoid legal hassles down the road. First, be sure employees can access their wages in cash without fees at least once a pay period. Some debit cards have fees connected to withdrawing money. But “free and clear access” to funds is required by many state wage and hour laws. Any payroll card program you put into place should allow this access in any one of a number of ways. They could include things like ATM withdrawals, convenience checks, cash back at point of sale services or bank teller transactions. Second, make sure employees have a choice other than a payroll card if they prefer it. According to the American Payroll Association and the National Consumer Law Center, employees cannot be forced to take a payroll card as their only payment option. Direct deposit might be one option. However, some state wage and hour laws my also require a paper check option. For example, a McDonald’s franchise in northeastern Pennsylvania was sued recently. The issue was a payroll card one former employee claimed had too many fees, the Huffington Post reported. The employee also claims the restaurant offered no other payment options. Make sure you have all the information before starting a payroll card program in your business. Payroll cards can work effectively so long as you follow all the rules. The post Payroll Cards Offer Alternative for Businesses and Employees appeared first on Small Business Trends. Speaking to journalists in Brussels on Monday Vigenin announced that Bulgaria can now patiently wait to become a member of Schengen Area as the country has already fulfilled all the requirements for accession to the Area , reported Bulgarian National Radio. “It is hard for me to figure out the latest statements. We have implemented all the possible ways of exercising control and securing the outer boundaries of the EU much better than many other countries which have already been in members of Schengen” pointed out Vigenin. 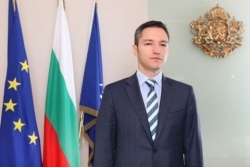 Bulgaria does not need to become a Schengen member urgently as the country is developing well, benefitting from its membership of a EU member, Vigenin stated. Among the advances Bulgaria will acquire becoming a member of the Schengen Area will regard the tourist sector. Transitional provisions allowed the EU countries to delay opening their labor markets to Bulgarian and Romanian nationals for a maximum period of seven years from the accession of these countries to the EU in 2007. Many countries lifted those restrictions long ago, but France will keep them until the deadline laid out in the treaties – January 1, 2014. Politicians such as Marine Le Pen, the leader of the French nationalist Front National (FN) promulgate this date as a red cloth, equating it to Romania and Bulgaria joining of Schengen, saying it would facilitate even further Roma emigration to France. Le Pen urged Valls to show France will firmly oppose the two countries Schengen membership. Among social media networks, Facebook is the undisputed king. A whopping 3.2 billion likes and comments are posted on the social media site daily, according to data collected by Media Bistro. The site now has 1.15 billion active users per month with about 699 million people logging on daily. Here’s how to leverage these users with a Facebook page that will build fans and customers. Creating your Facebook fan page is the first step in Facebook marketing. Create a Facebook Fan Page as a way to keep in touch with your customers. Use the channel to build your brand and to gain the ability to respond quickly to customers’ comments, feedback and questions. Your Facebook fan page should be a dynamic and interactive digital hub for your brand. Here’s how to get started. Choosing the right category and page name helps your fans, customers, and prospects to find you easily. It also lets those who don’t know about you discover instantly who you are and what you do. Picking the right category and page name also helps with SEO (search engine optimization) and allows for extra visibility and traffic from search engines. Marketing site MarketingGum.com has more on what each type of page means and how to choose the right one. But unless you are an artist, musician, public figure or in the entertainment industry, you will likely be choosing one of the first three. Important: You can change the name and category of your Facebook fan page later on, but you can’t change the type of page, so choose carefully. Next, you’ll want to load your logo and some images. 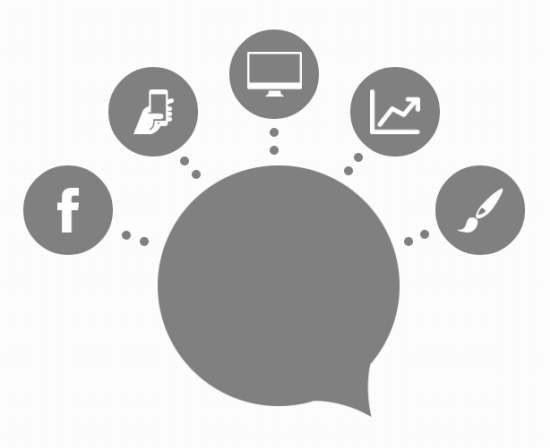 Assume you have been marketing your business for some time across multiple channels. You’ll want to keep your logo consistent. Your photos should give visitors an instant understanding of your business and the products or services you provide. Check out how major brands like Louis Vuitton, Windows and Coca Cola have used logo and photos to build their brands. Fill in the basic information about your business and add your website URL. Think of Facebook as a social window to your business. What you write here helps create first impressions. So use the right personality and voice to represent your business well. Facebook automatically gives you a dedicated URL for your Facebook fan page. However, the original one (default URL) is a mishmash of numbers, characters, and weird symbols no one would ever remember. Instead, claim your Vanity URL and change the address of your page to be more descriptive of your business. This will make it easier to remember and to promote later on. Pictures of people using your product. Custom graphics or photos that tell a story about your business or brand. Other materials related to your product or service: Album art work for musicians, a menu for restaurants, etc. A creative blend of images and graphics, perhaps incorporating both the cover photo and logo image, that tells something interesting about your business or simply attracts attention. Want more inspiration? Check out these creative examples of Timeline cover photos from Social Media Examiner. 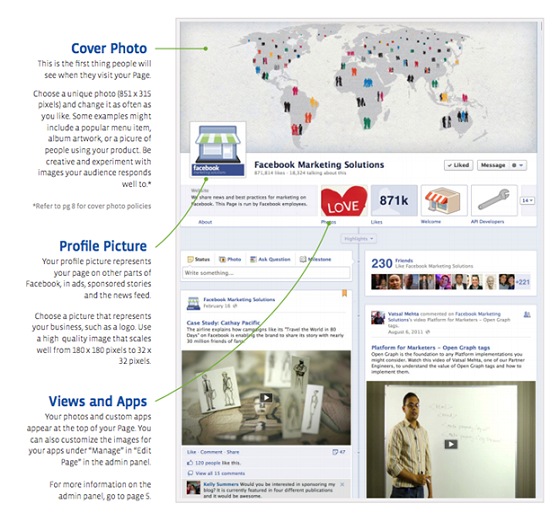 The Facebook timeline on your fan page is at the heart of engagement and brand building for your business. This is where it all starts. Andrea Wahl has a few good examples of how some businesses use timelines effectively. 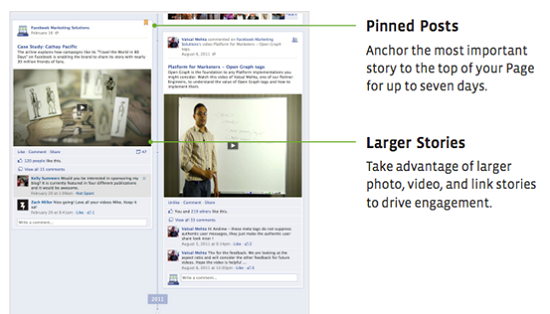 Facebook has added some new features such as the ability to “pin posts” and to showcase larger stories with extra large photos, videos and links to drive more engagement. You can add a “star” to highlight important stories or you can hide/delete stories if you decide not to display them on your timeline. You may even set milestones to define your key moments in history: Your startup date, your achievements, new branches, etc. You also have the ability to add specific milestone photos (843 by 403 pixels) as a way to use visuals for image enhancement. As you go about posting information, tips, and updates, photos, and milestones and responding to comments from your new fans, you’ll also want to keep an eye on how your engagement progresses over time. Facebook provides you all the tools you need to study engagement. 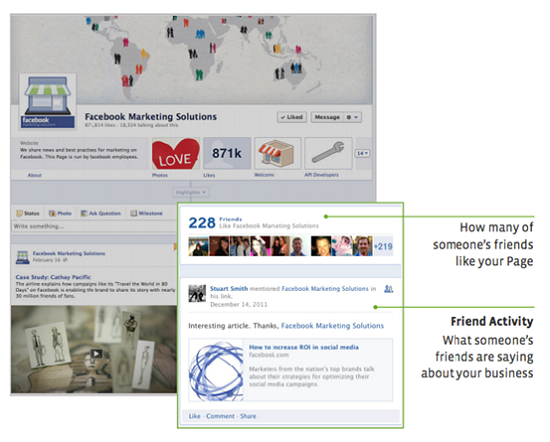 To start with, your friend activity snapshot gives you an overall look into how many of your friends like your page. You might choose to invite more people on your network when you think they’ll benefit from it. On your “Friend Activity” feed, you’ll also get to know what others have to say about your business. 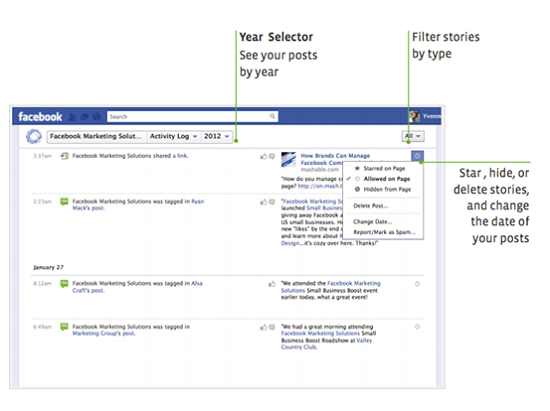 Facebook also provides you with a way to manage your posts and content over time. You could manage all your posts (including the ones you choose to hide) from a central location. You can filter stories by year or type, or edit, delete, or star posts. You can also choose to review timestamps and make sure your posts accurately show up under respective milestones. Once your Facebook fan page is live, it’s time to let the world know. Facebook gives you several ways to promote your fan page. You can “invite friends” or “promote your page” using paid advertisements targeted to other users. Your Facebook fan page, like any other digital property you own, has value by itself. So, it makes sense to promote and market your fan page just like you’d promote a website. Justin Wise of Social Media Examiner reveals 20 different ways to promote your fan page. The folks at Under30Ceo.com have another 7 ways to promote your fan page without spending a dime. Ann Smarty also has some advice to help promote your Facebook fan page and get lots of fans in a post at Search Engine Journal. Of course, you could go full-steam ahead on promotions (discussed in detail below): Do guest blogger outreach programs, launch webinars, give away free reports or whitepapers, get into conversations on other Facebook fan pages. You can join groups within and outside of Facebook, “like” other sites in hopes they will come back to “like” your page, and even use offline promotions to get the word out. Promotion > Exposure > Fans > Reach and engagement > Business. We live in a trust economy, as Gary Vaynerchuck of VaynerMedia puts it. To earn customers’ trust, you need to give them value first (often for free). Webinars aren’t for selling. They are for providing information and value. They are to motivate, educate, and train. Use webinars to “wow” your audience with information and value. Then ask them to “like” your Facebook page afterwards. 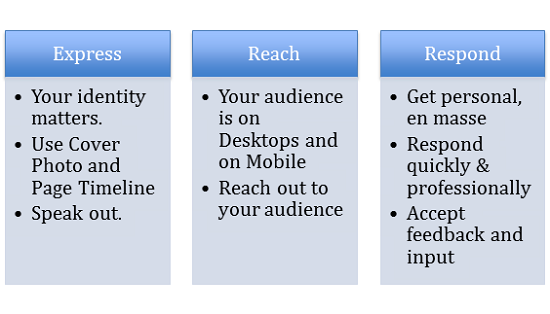 Place social media buttons or links within every email campaign. Print out links for your Facebook fan page on all your offline marketing campaigns. Be sure to include links for Facebook fan pages on your podcasts and videos. Marketers have taken to guest blogging as a form of outreach because you can leverage visibility on another popular blog. That often means that guest bloggers get extra traffic, credibility, exposure, and even conversions. Guest blogger outreach programs have been used for promoting blogs, businesses, and websites. But using a guest blogging opportunity to drive traffic to your Facebook page is another option. Distribute traffic equally to your fan pages and your website properties to get a better return from your guest blogging campaigns. Launch events on Eventbrite and start launching events locally on the subject of your expertise. Be sure to promote your Facebook page at the event and encourage those attending to visit and “like” it too. Another great way to promote your business using Facebook is to use contests, videos and giveaways to drive engagement on your page. You can take a DIY (do-it-yourself) approach or find some special apps to make these events easier to hold and promote. 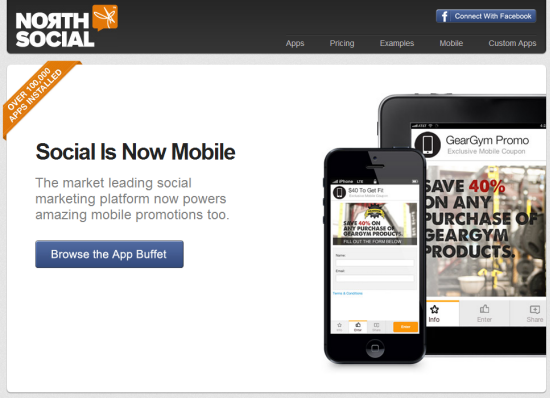 North Social has varying plans with apps including mobile sweepstakes, mobile coupons, and mobile signups (to leverage the fact that Facebook is big on mobile too). The regular apps include Instagram, deal shares, video channels, showcase, “show and sell”, “Twitter feed”, “ sign up page”, pages to make those “first impressions”, and much more. Note: There’s a workable plan here for just about any fan page. If you have more than one fan page to manage, you’ll have to look at special plans for large companies or agencies. Heyo, once called Lujure, provides an app that helps you launch promotions, deals, and contests. Using a drag-and-drop wizard, you can create fan pages that engage, interact, or maybe even dazzle your fans. 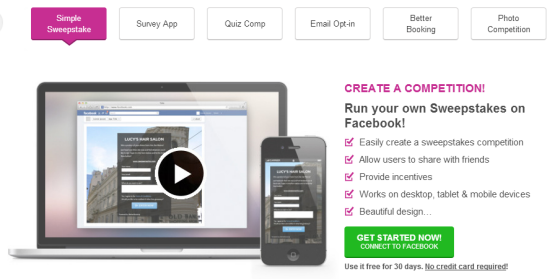 Social Candy has apps for running quizzes and sweepstakes, sharing content and coupons, and holding photo contests. 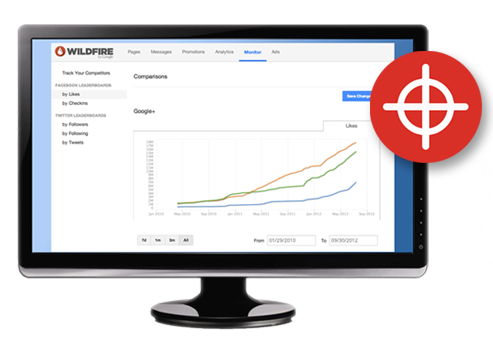 WildFire features interactive campaigns, large-scale analytics, and targeted advertising. Though it works for many kinds of businesses, it is clearly meant for companies and agencies that manage multiple brands. Marketing Gum has apps enabling email opt-in, surveys, sweepstakes, photo contests, and many other features to liven up your fan page. With a far more affordable pricing plan, it’s a budget alternative for bloggers and small businesses. Facebook provides you with Insights – its built-in metrics tool – to help you check on the progress, engagement, and growth of your fan page. Diana Urban on Ustandout.com provides a helpful post about how to use Facebook insights to measure and analyze your fan page. Often, you’ll need more than just Facebook insights. A huge suite of free and paid tools are available. 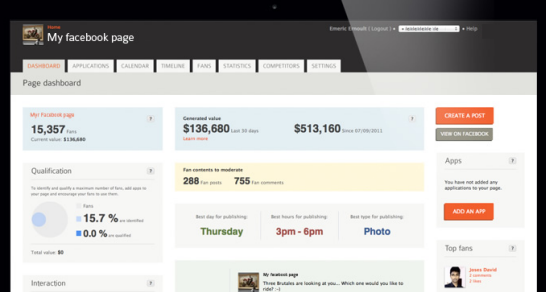 They include PageViral, Social Crawlytics, and many others. The post How to Create a Facebook Fan Page appeared first on Small Business Trends. American playwright and screenwriter John Pielmeier has met with the mayor of Bulgaria’s town of Veliko Tarnovo Snezh ana Daneva to discuss the film producer’s intentions to shoot scenes of his upcoming series on two prominent historical hills. Pielmeier would like to turn the Bulgarian hills of Trapezitsa and Tsarevets in the town of Veliko Tarnovo into a shooting stage for a part of his project about the ancient history of the European continent, Bulgaria’s newspaper Standard daily reported. The movie series will be broadcasted across Europe, according to the report. The project has been backed by the Bulgaria Dream Team Film Production Company. John Pielmeier is a famous American play scripter being acknowledged for his numerous productions of Broadway shows. You are currently browsing the Business, finances, forex blog archives for September, 2013.